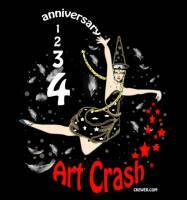 The original sin of Art Crash was committed four years ago. We dared to pick the fruit from the tree of knowledge of bicycles and art. Our collective experience that has since taken us far beyond what we would have imagined then. We ride the streets as though they were made just for us and consume the spectacle of contemporary imagination. We smash our mascots, then burning them. Always keeping a watchful eye out for the authorities that might otherwise put an end to our rabid ritual of sacrifice. In the end we feast like predators after a fresh kill. and be ready to roll at 5:30pm. Stay behind piñata otherwise you may lose yourself in the asphalt wilderness of terror. Only when we stay together can we hope conquer the evil cars that roam these streets and take their toll upon us without compassion, pity or remorse.